There have been many articles written about continuous improvement in manufacturing processes, but there isn’t a lot of information and understanding about the use of continuous improvement tools at the business level: including the ones that purportedly have continuous improvement or Six Sigma programs in place. In many of the organizations that we work in, when you speak to business process leaders about continuous improvement they believe that this doesn’t apply to them and that what they do can’t really be measured because it isn’t repetitive enough. This perspective supports their lack of knowledge of the power of Six Sigma and the appropriate application of continuous improvement tools on large cross functional business processes. Want no part of it! For those of us who have used continuous improvement tools to improve complex business processes, we know that it can yield 20x+ ROI’s to the organizations that take it seriously and implement the identified improvements. In one Group50’s recent projects, the ROI from the projects identified and being implemented is in the neighborhood of 40x and is material to the bottom line of a publicly traded company. In a recent project, we found that there was significant variation in how the leaders of 3 locations performed the same business processes. They had developed their own unique approach, performance measurements and shadow systems (side processes that aren’t measured, defined or managed). Just making them aware of this variation through Process Mapping lead to large and immediate improvements in their performance. 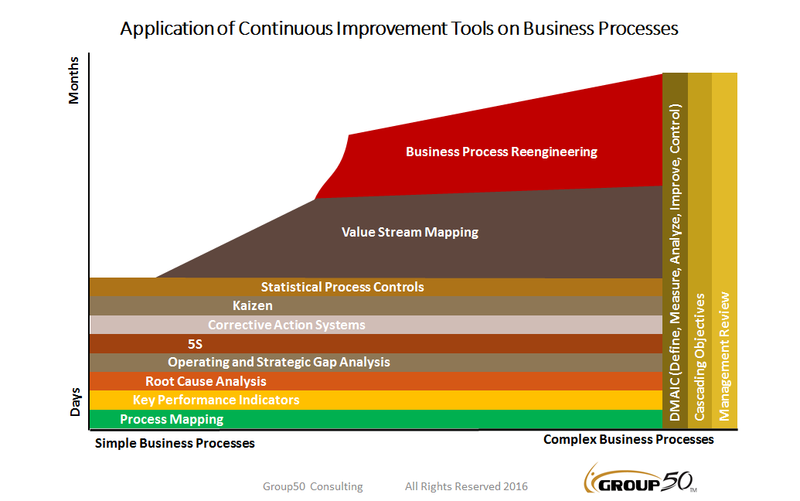 The graphic shows that there are many continuous improvement tools that should be utilized regardless of the complexity of the business process and there are a series of management activities that need to be done across all business processes (these are shown in the vertical bars on the right of the graphic). 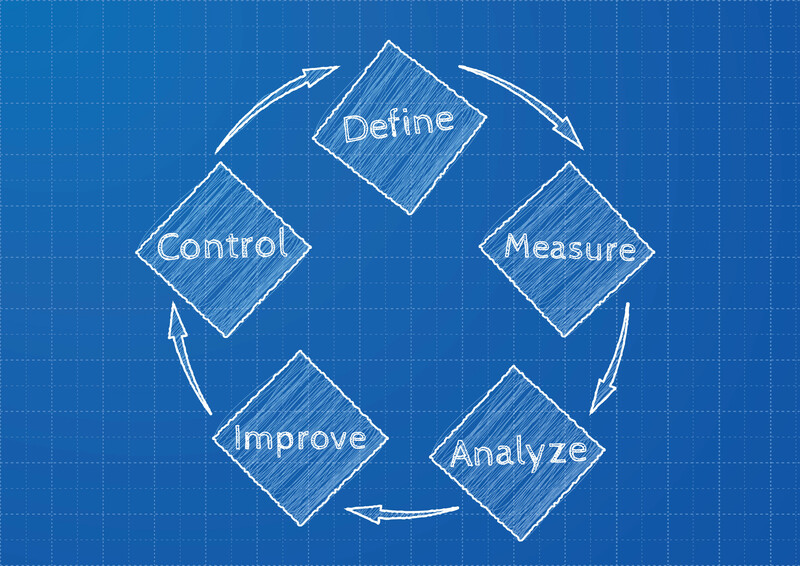 The most important continuous improvement tool and the starting point is the DMAIC (Define, Measure, Analyze, Improve, Control) methodology. It is the basis for understanding how business processes are configured, what their output is and how they need to be measured. 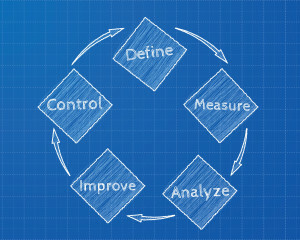 The DMAIC process requires a starting point which is usually a process map. The process mapping activity can be applied to business processes that range from very simple (i.e. making phone calls) to very complex (i.e. receipt of an order through shipping). Process mapping doesn’t require sophisticated tools. We prefer what we call the “Brown Paper Exercise”: A process map built on paper hung, built by the process owners, on the wall using tape, printouts and red paper showing improvement opportunities. We have seen long discussions by the process owners about how to improve their process. The result is almost magical. Process mapping starts the continuous improvement conversation. Our experience with business processes is that everyone has an opinion about how the process works and its’ required steps, but few people truly understand how the process works today! In a customer service project, executives thought that their customer service representatives spent 80% of their time on the phone, but when we finished the Value Stream Map and corresponding analysis, we found that the representatives were on the phone less than 15% of the time. They were doing many other things the executive team didn’t know about or understand. You are probably tempted to think that these guys didn’t understand their business or weren’t paying attention. To the contrary, this business is growing at 15-20% per year and has gross margins in excess of 60%. I am suggesting that even in well run businesses, it is not possible to know everything about your business and that the responsibility of process management lies with the owners of those processes. When they fail, executives pay attention after it is too late. Once a process has been documented, the next steps are to measure it in order to understand how the process performs. Choosing the right key performance indicators (KPI’s) requires an understanding the expected output of the process. In another project, we found that the expected output of a process was to review and validate data and because of productivity driven metrics, the reviews were partially done, done poorly, or not done at all. So, before a company moves down the path to improving a simple business process, it is imperative that they understand its purpose, expected output, the process and its’ operating gaps. More complex business processes require an additional step of understanding strategic gaps as well. All business processes need to perform to the strategic needs of the company and unless strategic gaps are considered, a continuous improvement project may optimize a process for its current state and be sub-optimized for the company’s strategic needs: something we call “Anti-Strategy”. Many continuous improvement programs are doomed because they aren’t prioritized or optimized based on the strategic needs of the company. As can be seen by the graph, one of the continuous improvement tools we haven’t discussed is corrective action systems. After all the work is done to improve a process, its performance will immediately begin to decline because of internal and external factors affecting it. If there isn’t an actively measured and managed corrective action system in place, then continuous improvement will provide a onetime hit and is only window dressing: not a real commitment by the management team. In another recent project, we found that IS related issues that weren’t actively managed cost man years of lost productivity per quarter so the operations team was fighting an uphill battle in maintaining the savings of their continuous improvement activities. Process owners now have to make choices about what additional continuous improvement tools are going to be used to improve the process. Some processes can be fixed very easily without much work through the application of tools such as 5S or Kaizens, while other more complex processes require the application of more sophisticated tools such Value Stream Mapping or Process Reengineering. It is critical that the appropriate tools are chosen otherwise a lot of money and effort will be wasted. More importantly, the continuous improvement process will fail and just be another example of a leadership “flavor of the month” program. Senior leadership needs to look at continuous improvement from a holistic perspective. Business processes are the backbone of every company and the selection of these tools needs to be done by practitioners who understand business processes at a strategic level: A skill set that many continuous improvement and Six Sigma practitioners don’t have. Selecting and effectively utilizing the appropriate continuous improvement tools can yield huge benefits. Doing it wrong can have a significant negative impact on the company and the organization. Read more Group50 articles on continuous improvement here. If you would like to contact Group50 about how continuous improvement tools can be used in your business, call us at (909) 949-9083, drop us a line at info@group50.com or request more information here. About the Author: Jim Gitney is the CEO of Group50, a continuous improvement consulting firm that specializes in business process improvement at every level of a business. Group50 consultants are operating professionals who have managed key business processes in every functional area. They understand how complex business processes work and how to substantially improve them.